Some poems are good medicine. Mindfulness poems invite us to bring our whole self to whatever moment we’re in, and truly live it. They encourage us to be more present, more attentive and compassionate, in the living of our days. They grant us a taste of being good enough, just as we are, in this world, just as it is. 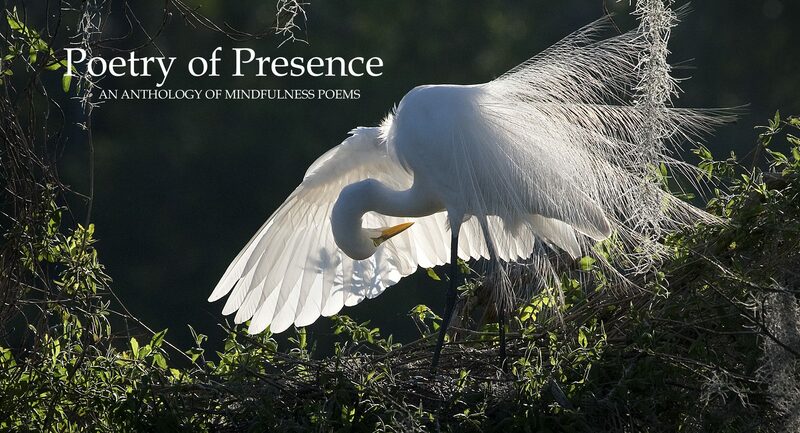 Poetry of Presence ($21.95; dimensions 6″ x 9″) is a collection of more than 150 mindfulness poems, mostly by contemporary or recent poets. These poems call us to the Here and Now, and help us to dwell there. The Here and Now is all that truly belongs to us, and as the poets say, it’s enough. This is a book for the times we live in. An inspiring read for lovers of beautiful, accessible poetry, it’s also a valuable resource for literature teachers, spiritual directors, meditators, interfaith clergy, mindfulness trainers, social workers, counselors, poetry therapists, hospice and grief workers, and medical personnel. Anthologized poets include Yehuda Amichai • Margaret Atwood • Ellen Bass • Wendell Berry • Robert Bly • Billy Collins • Mahmoud Darwish • Thich Nhat Hanh • Joy Harjo • Tony Hoagland • Miroslav Holub • Marie Howe • Erica Jong • Kabir • Galway Kinnell • Ted Kooser • Howard Nemerov • Kathleen Norris • Mary Oliver • Rainer Maria Rilke • Rumi • May Sarton • William Stafford • David Wagoner • Alice Walker and many more. Learn more about the connection between mindfulness and poetry, the background of the editors, and what people are saying about Poetry of Presence. Thanks to Ginny Connors and her team at Grayson Books, Poetry of Presence is finally off the ground. But as editors we need your help to make the book soar. Why? Grayson Books can keep this book in print only as long as we, the editors, continue to cover the high cost of permissions to reprint previously published poems. Please consider a modest donation to help us meet that expense. Click on the button below to make a secure gift by credit card or Paypal. Or, if you’d prefer, send us a check, payable to Back Productions LLC, 46855 200th St., Bruce, SD USA 57220. We thank you in advance, with full hearts. Your generosity will put Poetry of Presence into the hands of more readers.